The howls from the old boat next to our slip had increased dramatically by the second day. “Do you think we should go over and investigate?” Jeffery asked. 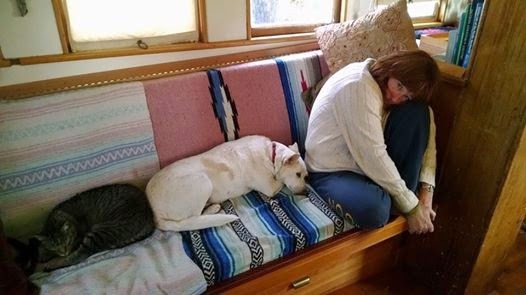 With that, my husband walked across our dock and climbed aboard the listing old workboat--rescuing a frightened old dog and changing the course of our life in the marina. 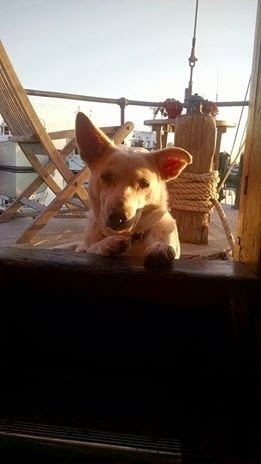 I didn't want a dog on a boat--I mean, If I wanted the hassles of living with a dog in the marina, I would have brought my pitbull Sasha onboard. And to top it off, this was an elderly dog, with elderly dog issues: she scratched incessantly at her dry skin and needed help up our steep companionways. Nevertheless, with much pleading from Juliet and rationalizations from Jeffery, I eventually agreed to allow her to stay--until we could find her owners. 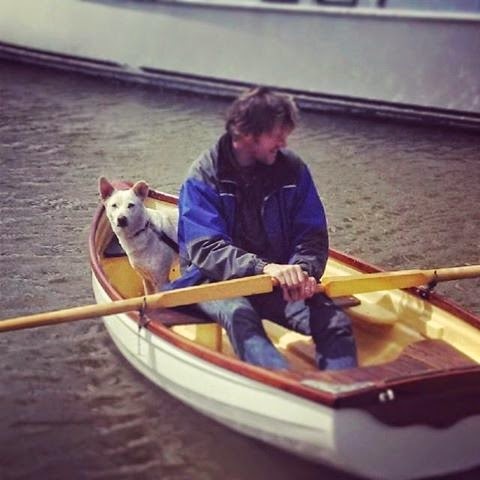 Five months later, we have pretty much adjusted to dog-on-boat-life... OK, well, the cat just tolerates it most of the time. I've stopped complaining about hair on the cushions, losing my place on the settee, late-night walks up the ramp and another animal underfoot as I cook our meals. I still wake up at 3 AM when she noisily licks all of her hot-spots... but hell, I figure when I get to be an 84-year-old-lady, I'll likely have hot-spots of my own to tend to. It seems that the trade-off is that we are privileged to share our home with an older dog--one who has spent a lot of time fending for herself. She's a well behaved, smart old girl. Her Dingo/Blue-Heeler breed characteristics make her somewhat of a herder, and she prefers us to stay on top of things--to keep moving once we're in motion. She deplores violence--or even the slightest hints of aggression. She'll bark sharply at Juliet and Jeffery if they start to wrestle or tease each other. (This makes me wonder what she was exposed to in her younger days). I find myself admiring her willingness to adapt. It reminds me to be more flexible with my own little challenges. I watch her take to new situations and experiences and think, Damn, if she can do it then so can I! I only hope that when I reach the senior citizen "golden years", I'll bravely jump into unfamiliar adventures as willingly as this old girl does. After her first week as a family member, Jeffery called for her to join him in our little tender. She blithely hopped in and positioned herself up in the bow. What a gal! 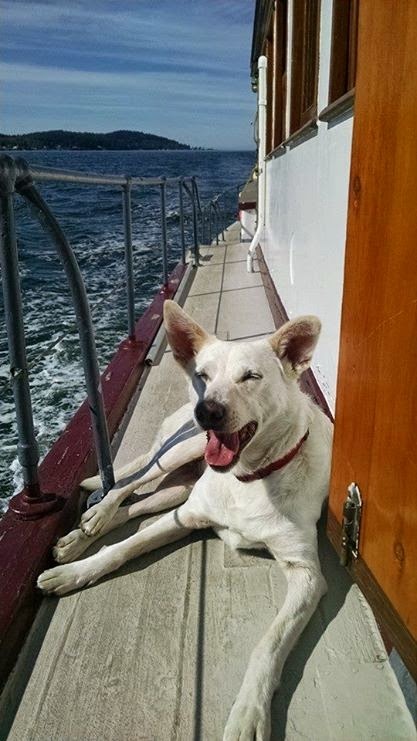 Since then, she routinely jumps from Kwaietek's deck onto the foredeck of Zeta--our little daysailer. We take her out for short sails in the marina and let her climb out on the bow, pulling her inboard when the wind picks up. When Jeff is here, she goes to work with him during the day. However he left for Alaska recently and I've resigned myself to a 24/7 companion. My former dog Sasha, allowed me at least a few hours of personal space, but Calypso can't be alone for more than two or three minutes. A dog's devotion and sense of loyalty is humbling, (even when you would appreciate a little less of it now and then). We aren't sure how much longer she'll share our life on the water. Her hips are arthritic at times and we must lift her up the companionways. She moves a little slowly in the morning (as do I more often), but I do love to watch her prance around like a Lipizzaner after her morning pee. The fact of the matter is, we are all learning a great deal from this dog. She sort of fits in well with a family that has chosen to live aboard an old wooden boat. I am reminded to appreciate the 'well-worn' creatures and celebrate those things around me that retain their use and their wisdom. 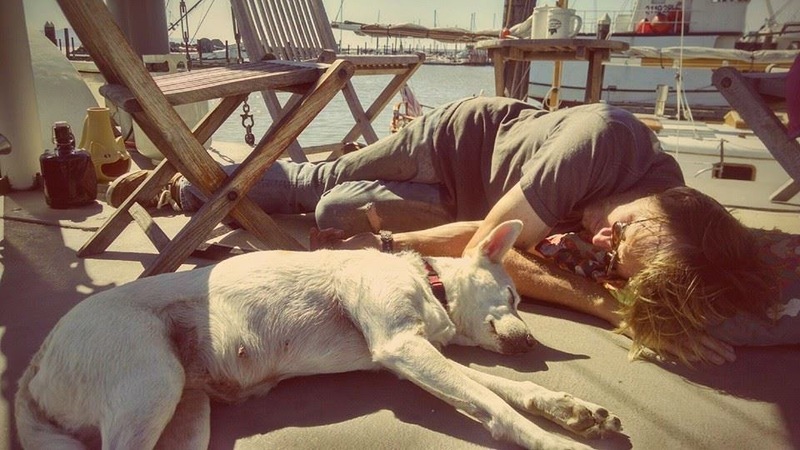 After all, in a world where the newest iPhone release causes internet hysteria and lines around the block, a vintage ship and an elderly dog are much-needed nods to a slower and more thoughtful time. What a wonderful dog. I wonder what her story is and how she ended up on that boat? Sad, but with a happy ending on a beautiful boat. She apparently walked twenty five miles from a farm where she'd been left. She identified that boat as "home"--or her last home of many. The security guys from the marina left her onboard for three days with a bowl of water (assuming that her owner was around I suppose). We freed her and left notices up around the marina and Craigslist. Two weeks later, a friend of her former owners asked to take care of the dog. We reluctantly agreed, (by that point we'd grown sort of attached)... after five weeks, the friend called Jeffery wanting to give her back because their landlord said "No dogs". We re-adopted her and have had her all summer now. She doesn't even glance at her former boat as we walk down the dock.